Add contemporary style to your bathroom with this floral shower curtain from The Curated Nomad, which features cheery white and yellow flowers against a muted grey background. Made from 100-percent cotton sateen, this printed shower curtain offers a luxurious look and feel with the convenience of easy at-home care in your washing machine. I noticed some negative reviews regarding the quality of this item and I must disagree. At first I was disappointed, but I ironed the curtain with spray starch and it's perfect! Lovely and graceful drape. Nice sheen. Just what I wanted. I also purchased the quilt set and there were no matching window curtains. I'm using these shower curtains as drapes with a tiny bit of alteration. You can hang two curtains with one of them upside down and it gives you the perfect balance with the print! Problem solved and it looks great. Get out that old iron and you'll be very pleased. I love the muted yellow and grey in this curtain. The combination is lovely and looks very nice. It is durable and looks great with my grey shower liner. It looks like it would be easy to launder although I have yet to do that. This shower curtain looks just like it does in the picture. I washed it up, dryed it and hung it to get the wrinkles/plastic smell out. We love it! Reccommend it! The Sateen Printed Shower Curtain is Amazing!!! I used it at our Cooper Terrace designer rental and it rented immediately... Beautiful and goes so perfectly with the Grey and Yellow color scheme we created throughout the unit.... I had also located the quilted bed spread in the same pattern at another site, but the pattern was the star of the space and we had potential tenants fighting to fill out the applications.... Thanks again--- Happy customer in *** . Not only is this shower curtain stylish but it's pretty. I had been looking for just the right shower curtain but drew the line at nearly $!00 for one. I actually though that this one was the same but a whole lot less expensive. The flowers were just a bit smaller but the only way I knew it was to look at the 2 pictures side by side. This shower curtain is well made and in the newest color combo. I would recommend it to my friends. 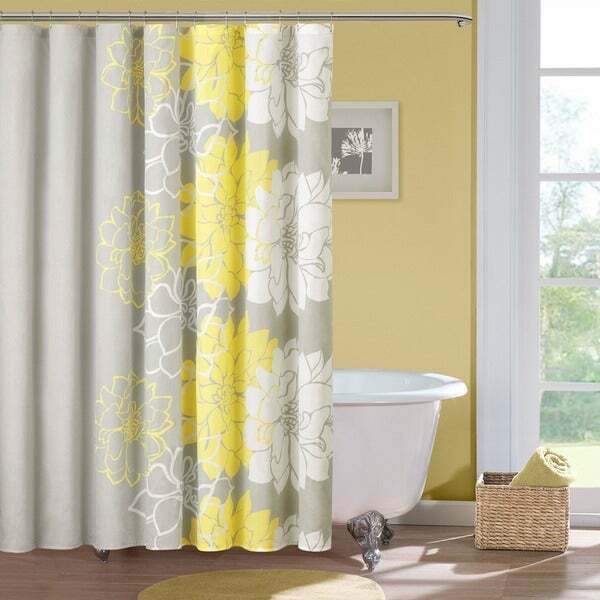 Redoing my bath and bedroom in grey & yellow and this is a awesome shower curtain. The yellow & grey are the perfect color not to soft & not to bright. Great buy. This shower curtain is nice, but the colors are not as vibrant as the photo. The grays and yellows are very faded or dull looking. The curtain is not heavy as a shower curtain should be, more like a plain cotton sheet, and in fact it is cotton so I worry about shrinkage. When I have it put together with all my bathroom accessories it does look nice, even not being as heavy or vibrant as it should be. Price is a bit to much for the quality. 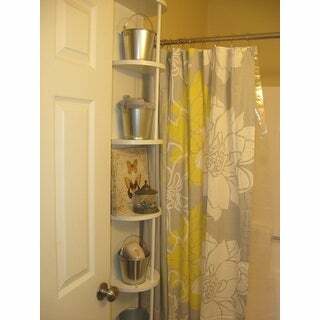 I purchased this for my guest bathroom, to coordinate with the bedroom set from the same brand in guestroom. I was horrified to find I had spent about $$ on a very cheap, very thin shower curtain that appears to be a wrinkly top sheet with button holes at top. Imagine the worst sheets you have had. Now imagine that permanent bent over wrinkle that cheap cotton gets- can be a shirt collar or the hem of a shirt, etc- now picture that hanging limply from the shower rod. Worst shower curtain I have ever seen, and the fact that the word 'sateen' was added to it is a huge and horrifying joke. Cheap dull and way too thin cotton. Unbelievable. Will never trust these people again. I love this shower curtain. It is good quality and looks great in my bathroom. It said don't iron but it needed to be ironed. It looks much better in the picture. The curtain in picture is a true refection of the product. 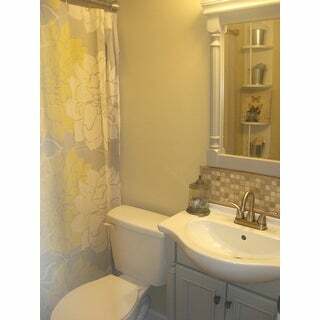 The color and style worked well for the guest room bathroom. The curtains were silky and needed to be ironed with starch spray which turned out well. It looks great with the matching guest room bedspread ensemble. Everyone in my family loved this shower curtain. It stands out. Love it and would definitely recommend this. Beautiful fabric. I did not use as a shower curtain. I made it into a window valance. I did't like the material. perfect match to my comforter. Based my gray and yellow bedroom off of these 2 pieces. As pictured. Looks really good in my bathroom. 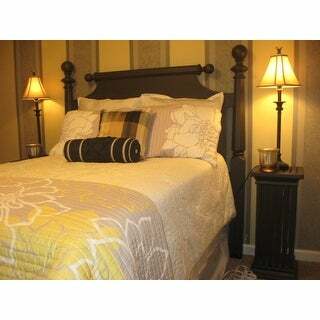 Goes great with my bedroom set and looks really great in the bathroom, very good quality. "does this shower curtain (the blue and brown one) come with any kind of matching rugs or towels? It is hard to tell from the photo the exact color of the blue is to find a rug or towels that matches." 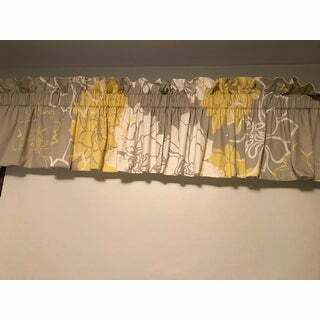 This curtain measures approximately 72 inches high x 72 inches wide. "I meant to add that the last one I purchased was about $10.00 cheaper." Unfortunately item prices can change according to availability and promotional pricing. For more on price changes: (https://help.overstock.com/app/answers/detail/a_id/48). "I already ordered one shower curtain and would like to know if I would get a discount if I ordered 2 more. I am using them to make a bed skirt to go with the matching bedspread because I'm not happy with the one that came with the set." Unfortunately, we do not currently offer discounts for multiple quantities. "What are the dimensions on this shower curtain?" Hello tjt, the dimensions are approximately 72" inches high x 72" inches wide. Please let us know if you have additional questions. Thanks for shopping with us. "Does this shower curtain need a liner?" Hello lvmygrdn, we do recommend using a liner with this curtain. Please let us know if you have additional questions. Thanks for shopping with us.